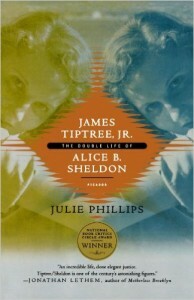 In which we celebrate Alli Sheldon’s centenary with the first of our James Tiptree Jr spoilerific episodes and stand in awe of her extraordinary life, and the hard work of her biographer, Julie Phillips. You can get us at iTunes or Galactic Suburbia. IMPORTANT ANNOUNCEMENT: Galactic Suburbia now has Messagebank on its Skype number, so you can leave us audio feedback. I know, right??? This month, we would particularly appreciate comments about your favourite Tiptree work, thoughts on the Julie Phillips biography, or on the short fiction we’ll be discussing later this month. We would love to be able to include your audio feedback in future episodes (so make sure to let us know if your comment is not something you wish to be broadcast). You can order the upcoming Letters to Tiptree from Twelfth Planet Press – a selection of thoughtful letters written by science fiction and fantasy’s writers, editors, critics and fans to celebrate her, to recognise her work, and in some cases to finish conversations set aside nearly thirty years ago. The book also contains archived letters between Tiptree and some of her dearest correspondents. Please send feedback to us at galacticsuburbia@gmail.com, follow us on Twitter at @galacticsuburbs, check out Galactic Suburbia Podcast on Facebook, support us at Patreon; and don’t forget to leave a review on iTunes if you love us!